You'll explore the less-touristy side of things at Scuba & Snorkeling and Passage Peak. And it doesn't end there: go for a stroll along the water at Hamilton Island Marina, kick back and relax at Catseye Beach, head outdoors with Jetryder, and get your game on at Sports Club. For where to stay, reviews, maps, and tourist information, go to the Hamilton Island trip itinerary maker website . London, UK to Hamilton Island is an approximately 28-hour flight. You can also do a combination of flight, bus, and ferry. The time zone difference moving from Greenwich Mean Time (GMT) to Australian Eastern Standard Time (Queensland) (AEST) is 10 hours. Traveling from London in January, things will get much warmer in Hamilton Island: highs are around 35°C and lows about 28°C. Cap off your sightseeing on the 20th (Mon) early enough to travel to Whitsunday Island. Kick off your visit on the 21st (Tue): enjoy the sand and surf at Whitehaven Beach and then contemplate the waterfront views at Hill Inlet. On the 22nd (Wed), you'll have a packed day of sightseeing: step off the mainland to explore Whitsunday Islands National Park. For traveler tips, maps, reviews, and tourist information, refer to the Whitsunday Island trip planner . 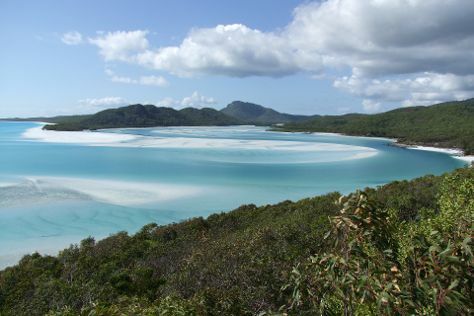 Explore your travel options from Hamilton Island to Whitsunday Island with the Route module. January in Whitsunday Island sees daily highs of 36°C and lows of 26°C at night. Wrap up your sightseeing by early afternoon on the 22nd (Wed) to allow time for travel to Brisbane. You'll explore the less-touristy side of things at Burleigh Heads Beach and SkyPoint Climb. Change things up with these side-trips from Brisbane: Coolangatta (Snapper Rocks, Coolangatta Beach, & more), Sea World Theme Park (in Main Beach) and Surfers Paradise Golf Club (in Clear Island Waters). Spend the 27th (Mon) with some fine spirits on a distillery tour. There's much more to do: walk around South Bank Parklands, admire the natural beauty at Roma Street Parkland, admire all the interesting features of Suncorp Stadium, and take some stellar pictures from Mount Coot-tha Lookout. 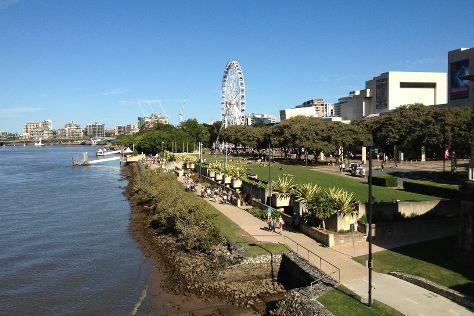 To see other places to visit, reviews, where to stay, and other tourist information, use the Brisbane trip maker website . Traveling by flight from Whitsunday Island to Brisbane takes 3.5 hours. Alternatively, you can do a combination of bus and flight; or take a train. In January, daytime highs in Brisbane are 34°C, while nighttime lows are 25°C. Finish your sightseeing early on the 30th (Thu) so you can drive to Noosa. Discover out-of-the-way places like Carlo Sand Blow and Noosa River. You'll find plenty of places to visit near Noosa: Mooloolaba (Scuba & Snorkeling & SunJet Simulations), Caloundra (Kings Beach & Bulcock Beach) and Mount Coolum (in Coolum Beach). Spend the 3rd (Mon) exploring nature at Noosa National Park. There's much more to do: browse the eclectic array of goods at The Original Eumundi Markets, stop by Berkelouw Book Barn, take in the exciting artwork at Noosa Regional gallery, and enjoy the sand and surf at Maroochydore Beach. To find photos, maps, where to stay, and other tourist information, you can read our Noosa planning site . Drive from Brisbane to Noosa in 2 hours. Alternatively, you can take a train; or take a bus. Finish your sightseeing early on the 6th (Thu) to allow enough time to travel to Fraser Island. Discover out-of-the-way places like Eli Creek and Seventy-Five Mile Beach. To find where to stay, traveler tips, photos, and other tourist information, go to the Fraser Island trip planner . Getting from Noosa to Fraser Island by combination of car and ferry takes about 7 hours. Other options: do a combination of train, ferry, and car; or do a combination of bus, ferry, and car. In February, daily temperatures in Fraser Island can reach 35°C, while at night they dip to 24°C. Finish your sightseeing early on the 11th (Tue) to allow enough time to travel to Yamba. Yamba is a town in northern New South Wales, Australia at the mouth of the Clarence River. Step off the beaten path and head to Pippi Beach and Turners Beach. 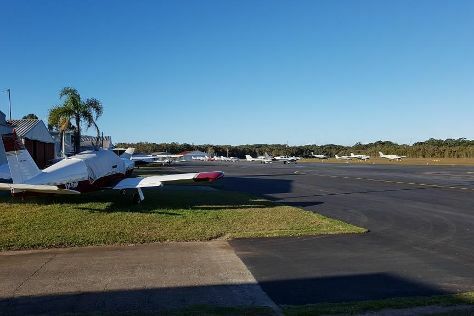 Get out of town with these interesting Yamba side-trips: Iguana Beachwear Gifts & Home Decor (in Iluka) and Evans Head (Evans Head Memorial Aerodrome Heritage Aviation Museum, Razorback Lookout, & more). There's lots more to do: kick back and relax at Main Beach Yamba, explore and take pictures at Maclean Lookout, see majestic marine mammals with a dolphin and whale watching tour, and stroll through Iluka. Plan my trip to Yamba with suggested itineraries provided by Inspirock. Use the Route module to find suitable travel options from Fraser Island to Yamba. In February, daily temperatures in Yamba can reach 34°C, while at night they dip to 22°C. Finish your sightseeing early on the 16th (Sun) to allow enough time to drive to Byron Bay. Explore hidden gems such as Stand-Up Paddleboarding and Belongil Beach. Get out of town with these interesting Byron Bay side-trips: Watersports Guru (in Kingscliff), Tweed Regional Gallery & Margaret Olley Art Centre (in Murwillumbah) and Lighthouse Beach (in Ballina). On the 22nd (Sat), give your taste buds a day to remember with a local gastronomic tour. And it doesn't end there: indulge in some personalized pampering at some of the best spas, enjoy the sand and surf at Tallow Beach, sample the tasty concoctions at Stone and Wood Brewery, and hike along Cape Byron Walking Track. To see maps, other places to visit, traveler tips, and other tourist information, you can read our Byron Bay trip builder site . Traveling by car from Yamba to Byron Bay takes 2 hours. Expect a daytime high around 34°C in February, and nighttime lows around 21°C. Wrap up your sightseeing on the 23rd (Sun) early enough to travel to Sydney. Step off the beaten path and head to Kiama Blowhole and Nan Tien Temple. Get out of town with these interesting Sydney side-trips: Katoomba (Canyoning & Rappelling Tours & Wentworth Falls) and Shelly Beach (in Manly). 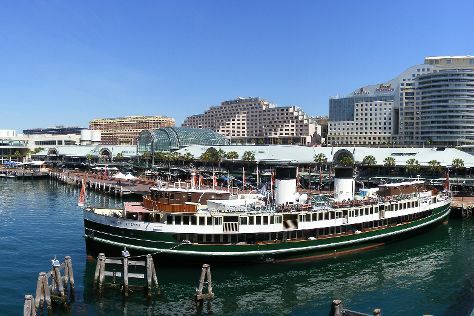 There's lots more to do: wander the streets of Darling Harbour, trek along The Opera House to the Botanic Gardens Walk, examine the collection at Australian National Maritime Museum, and get to know the fascinating history of The Rocks. To find photos, reviews, other places to visit, and tourist information, use the Sydney trip planner . Traveling by combination of bus and flight from Byron Bay to Sydney takes 4.5 hours. Alternatively, you can drive; or do a combination of bus and train. In February, daily temperatures in Sydney can reach 31°C, while at night they dip to 23°C. Wrap up your sightseeing on the 3rd (Tue) early enough to travel to Melbourne. Eschew the tourist crowds and head to Spas and Healesville Sanctuary. Explore Melbourne's surroundings by going to Geelong (The Food Purveyor & Eastern Beach Reserve), Ballarat (Ballarat Wildlife Park, Ballarat Botanical Gardens, & more) and The Great Ocean Road (in Torquay). Dedicate the 10th (Tue) to wine at some of the top wineries in the area. Next up on the itinerary: make a trip to Royal Botanic Gardens, indulge your taste buds at Food & Drink, learn about all things military at Shrine of Remembrance, and take in panoramic vistas at Eureka Skydeck 88. To find traveler tips, maps, other places to visit, and other tourist information, go to the Melbourne trip planning website . Getting from Sydney to Melbourne by flight takes about 3.5 hours. Other options: do a combination of flight and shuttle; or drive. Traveling from Sydney in March, expect a bit cooler with lows of 15°C in Melbourne. On the 14th (Sat), you're off tohome.